The meteoric rise in mobile device popularity and tech capability has fueled the extremely popular mobile app industry. Mobile games are amongst the most popular types of apps—in 2017, 80% of all app revenue came from gaming apps for both the Apple iOS App Store and Google Play Store. The global gaming market is targeted to reach $115 billion in 2018; the mobile gaming industry accounts for $50 billion dollars in all of global gaming revenue. It’s clear that the mobile app industry is lucrative and continuing to grow in size each year. How do mobile games make money? Game monetization is the method by which a game product makes money for its developers and copyright owners. There are various revenue models that mobile games use to generate profit. Mobile games have come a long way since the days of playing Nokia’s Snake on a tiny screen. The first known mobile game was a prehistoric version of Tetris, installed on a mobile phone called Hagenuk MT-2000 in 1994. The launch of Apple’s App Store in 2007 marks the early days of mobile gaming as we know it today. Developers flooded the marketplace with games, many of which were incredibly addictive. Some early hits have faded from memory (Angry Birds, est. 2009), while others remain dominant in popularity (Candy Crush, released in 2012). Mobile gaming apps have never been more sophisticated and new developments like real-time multiplayer abilities, livestreaming, and cross-device synchronization continue to drive industry growth. Another growth factor is the explosion of social media interest in gaming on platforms like Twitch and YouTube. 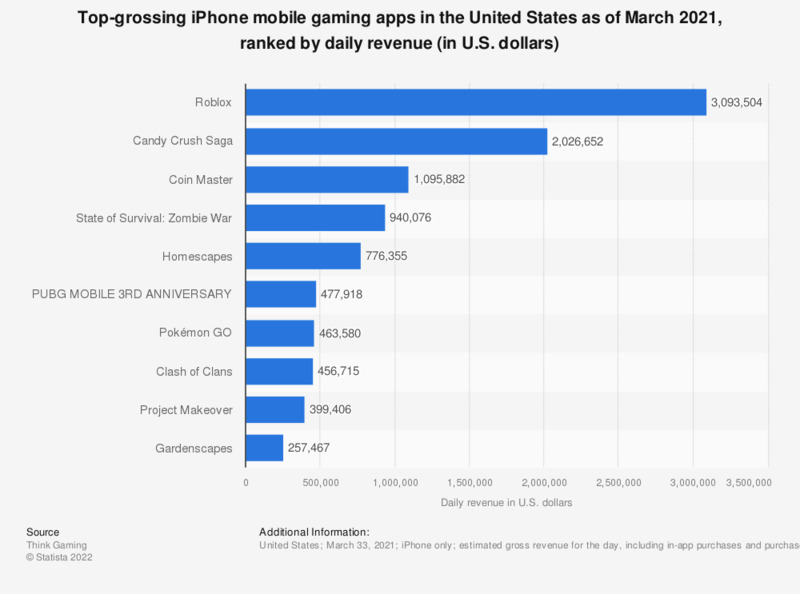 As of April 2018, top mobile games like Fortnite and Candy Crush Saga earned more than one million dollars in daily revenue on iPhones alone. The very first gaming apps fell into one of two broad categories: 1. Free Mobile Games (sometimes monetized through ads); 2. Paid Mobile Games (just a single upfront payment). Now, gaming monetization models have become significantly more complex and varied. The lucrative nature of mobile gaming influences game design and development, so creators can profit from their games. Free-to-Play (F2P or FTP) games are free to initially download, but require payment for various upgrades. Freemium games are free to download and play but offer small in-game purchases known as microtransactions. The top grossing mobile games in 2018 have all been freemium model games, for example Clash Royale, Fortnight Battle Royale, and Candy Crush Soda Saga. Microtransactions allow players to purchase additional virtual goods like extra gameplay levels, cosmetic skins, exclusive gear (e.g. armor, shields), loot boxes, or in-game currency. In-game purchases vary - some enhance the player’s power or speed up their progress within the game, while others are entirely cosmetic. An example of a microtransaction for a roleplaying game (RPG) is a player purchasing a limited-edition potion which gives their character special powers that would be otherwise very difficult or time-consuming to obtain via normal gameplay. Since the purchases are usable within the game, microtransactions are especially tempting for avid, devoted players. Microtransactions can potentially lower the skills barrier needed to progress within the game, which can make the game feel out-of-whack for those who choose not to spend. Game developers must be very careful in designing microtransactions so that don’t significantly unbalance competition between players or worse, make players feel extorted (i.e. feel like they must spend their money to be able to function within the game). Advertising model games are typically free, but contain ads as a means of revenue. Display ads are the most standard type, which can include static ads, dynamic display ads, banner ads, video ads, and pop-up ads. Neko Atsume occasionally inserts dynamic display ads as a small banner at the bottom of the screen. Interstitial ads are ads that are shown automatically in intervals. Interstitial ads are common for games with a level-up progression since they can be displayed between levels where there is a natural break in the gameplay, making them relatively unintrusive. For example, Ray-Man Adventure requires the player to watch a 30-second video after beating a level. Incentivized ads offer an in-game incentive, like an in-game currency or a boost, in exchange for interacting with an ad (e.g. watching a video ad). Puzzle game Candy Crush will offer to give users a bonus if they watch a short video before beginning a new level. Contextual ads are integrated into gameplay, often as branded gameplay objects or branded storefronts within the scenery of a game. Think branded Pokestops in Pokemon Go or billboards on the streets of Grand Theft Auto. Shareware model games will allow you to play a free trial or demo version of a game, but require payment to unlock the full game license. Shareware gives free users limited gameplay compared to the full game - the idea is to entice users to pay for the game once they’ve gotten a taste. This model somewhat outdated as the vast majority of mobile game developers have embraced freemium. Up-front payment model applies to games that are purchased via a one-time payment then downloaded directly onto a mobile device. A few popular examples of paid games include Minecraft, NBA 2K18, and Grand Theft Auto: San Andreas. Subscription model games charge a recurring fee to continue playing them, usually on a monthly basis. It’s uncommon for mobile games to use the subscription model - it’s more frequently used for massively multiplayer online games (MMOs) and other video games that require continuous server hosting and administrative overview in order to operate. Mobile games don’t lend themselves to a subscription model in part because they tend to be fleeting in popularity. Consumers tend to grow bored of mobile games, constantly looking for a novel diversion. That said, chief marketing officer Al Campa of the business intelligence form App Annie predicts "I think you'll start to see subscriptions making their way into gaming.” The success of media apps like Netflix and Spotify suggest that there’s a market for paying a monthly subscription to access collections of games. “The gaming world needs to continue coming up with new hits all the time," explains Campa. Mobile games with a strong brand and fanbase can tap into revenue streams outside of the app itself. Event marketing hosted by game creators bring together an army of avid gaming fans. From huge conventions like E3 and VidCon to regional competitions, gaming fiends are eager to connect with fellow fans at events. Other in-person events that draw die-hard fans include charity tournaments, festivals, and one-off experiential events. These photogenic, interactive events create photo-worthy moments for selfies, videos, and tweeting, which helps them to amplify the brand’s message beyond those in attendance. There’s significant opportunity to sponsor an event to further establish a gaming brand. Merchandise is another outlet for mobile gamers to bring in revenue. Zealous gaming fans will don T-shirts and snap up collectible merchandise as an extension of their love of the game. Popular games, as well as cult indie games, can commoditize their brands by producing merch. Game developers have come up with truly ingenious tactics to make their games profitable. Leveraging a sizable pool of user behavior data, game creators learn to push the buttons of their gaming community. Game developer companies with a large roster of titles can test out different tricks and dedicate manpower towards marketing various upsells. Whales, named after high rollers at casinos, are players who spend a disproportionate amount compared to other players. Although gaming apps aim to draw revenue through all of their players, they tend to make the bulk of their earnings from a smaller subset of devotees. In addition, some mobile games [World of Tanks Blitz, Poker King, TMNT Legends] offer a monthly VIP or premium tier accounts, which offer gameplay bonuses within a pre-specified timeframe. Special offers can lure an apathetic player by giving them a strong incentive to make a purchase and get back in the game. Like an e-commerce display ad showing that an item once abandoned in a shopping cart has since gone on sale, special offers are all about timing and knowing one's audience. A once avid player hasn’t opened the app in over a month? Offer a discounted starter pack for a hot new game. Is a player grinding to beat a boss? Tempt them with a special booster pack that will help them build skills more quickly. A user is obsessed with customizing their avatar character? Sell them a pack of limited-edition skins or clothing. Game creators can market offers via emails, push notifications, and in-game banner ads. This makes the messaging almost inescapable to a heavily invested player. In a sense, it’s unsurprising that mobile games are so lucrative. Considering the domestic market alone, 77% of Americans have smartphones and are virtually always with them. People frequently look at their phones out of habit and boredom and mobile games provide an instant dose of entertainment. The industry is ripe with potential for customer loyalty and a large customer lifetime value. Mobile games are a great fit for influencer marketing partnerships because they appeal to all demographics and have a low barrier to entry. Since the majority of people own a smartphone and have access to mobile app marketplaces, a game download conversion can happen with just the tap of a smartphone. Mobile games lend themselves well to videos and screenshots, meaning that creators can easily develop visually compelling content that will showcase video games in action. More and more video streaming platforms promote gaming as the industry continues to expand. Influencer marketing will continue to play a role in mobile app monetization going forward. Although freemium is currently the dominant form of monetization, the ever-changing industry will continue to evolve. It’s possible that subscription to access a library of games (ala Netflix) or a new game-changing monetization model will crop up as mobile gaming continues to evolve.